For propagating cuttings or quick-starting seeds, rooting transplants or seedlings, no other hydroponic system will match the performance of the RainForest². This system is ideal for starting plants or even growing plants to maturity and on to harvest. 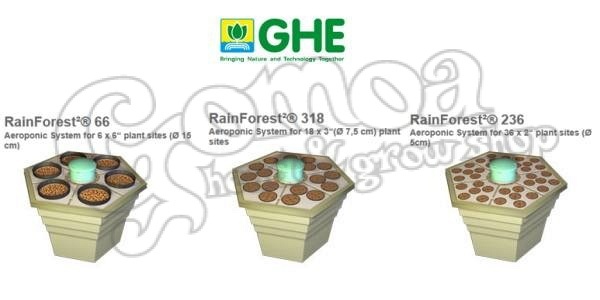 Many growers choose to start their plants in RainForest modules and later transplant them into larger systems or in soil. The RainForest 318 can accommodate up to 18 small plants from cuttings to harvest, or up to 90 cuttings for rooting and transplantation using the 3" CocoTek® coconut caps included. Vortex® Sprayer lifts and oxygenates the nutrient solution, and then gently distributes it over cuttings bases or root systems. Operates at 240 Volts AC. The RainForest²Ž allows you to germinate your seeds or root your cuttings, and grow your plants all the way to harvest, thus avoiding transplanting and the stress linked to this process. Thanks to the exclusive oxygenating and spraying capacity of its Vortex® Sprayer, which lifts the nutrient solution and gently distributes it over the cutting's bases or root system, it creates such a healthy environment in the root zone that there is no need for the old domes found on traditional propagating systems. The large capacity of its reservoir helps stabilize pH and EC levels. Its interior central column protects the roots from the spinner, and allows them to grow safely in the reservoir. Last but not least, the RainForest²® allows to eliminate heavy and cumbersome substrates. In keeping with our commitment to the environment, the RainForest² is now available with a new 12 Volts "Vortex®". It uses 50% less electricity than in 120 and 240 Volts, it never heats, it can be hooked on the usual alternative current and... it is adapted to solar panels, for those who already opted for alternative sources of energy! Dimensions: 2' x 2' (63 x 63 cm hexagonal), and 43 cm high.